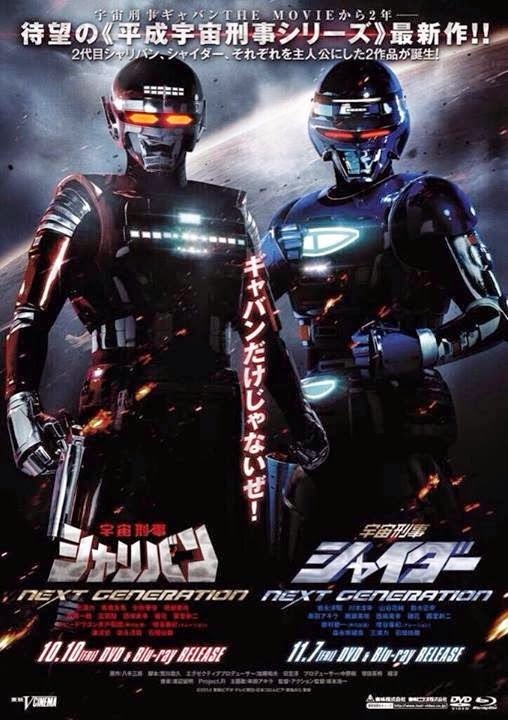 Recently revealed online is the first promotional poster for the V-Cinemas; Space Sheriff Sharivan NEXT GENERATION and Space Sheriff Shaider NEXT GENERATION. It was reported previously that a new Space Sheriff's named Estevan (Uchū Keiji Esuteban 宇宙刑事エステン) will debut in the said films. The movies are set after the events of Uchuu Keiji Gavan The Movie and Super Hero Taisen Z. Cast includes Misaki Momose who will play Sharivan's new partner Shishi (Dino Girl Lemnear/Zyuden Sentai Kyoryuger Gaburincho Of Music) and also Yuma Ishigaki returns as Gavan Type-G.
Sheriff Sharivan NEXT GENERATION and Space Sheriff Shaider NEXT GENERATION will be directed by Koichi Sakamoto, and will be released on October 10th and November 7th respectively, with a limited first edition priced at 4500 yen on DVD and 5500 yen on Blu-Ray.